The 72Mhz FEZ Panda II runs .NET Micro Framework, allowing users to program and debug FEZ Panda using Microsoft's free Visual C# Express. Applications are loaded over USB cable (or serial) with full featured debugging capabilities, such as stepping in code or inspecting variables. FEZ Panda II is an enhanced versi with On-board microSD socket, Real Time Clock, and an easily accessible 40-pin female header that exposes the extra IOs. FEZ Panda II also includes JTAG access for those who wish to use their own firmware instead of NETMF. Using an Arduino-form-factor, you can use just about any Arduino shield. 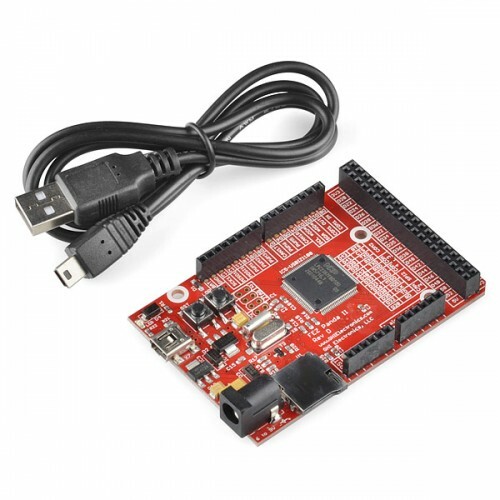 In addition, many libraries are already included like FAT file system, networking, threading, USB Client, UART, SPI, I2C, GPIO, PWM, ADC, DAC and many more. The FEZ Panda II includes a USB cable.